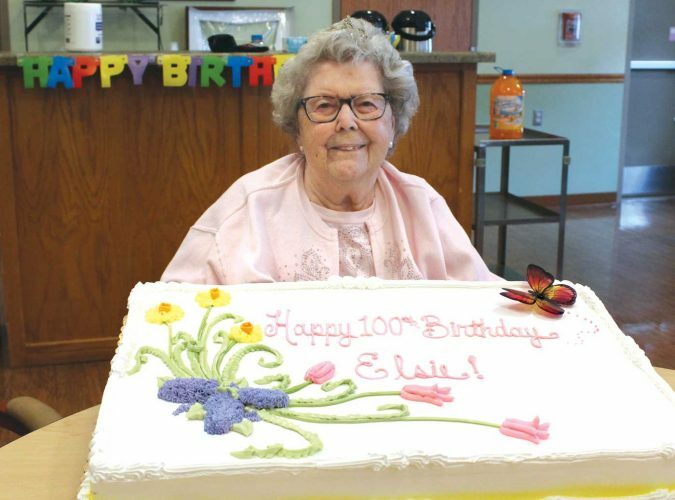 Members of the Northwoods Garden Club hosted a strawberry ice cream social July 8 in Kingsford, with more than 100 people attending. Lois Wall, Sue Varda, Sarah Niesculz prepare for the crowds. 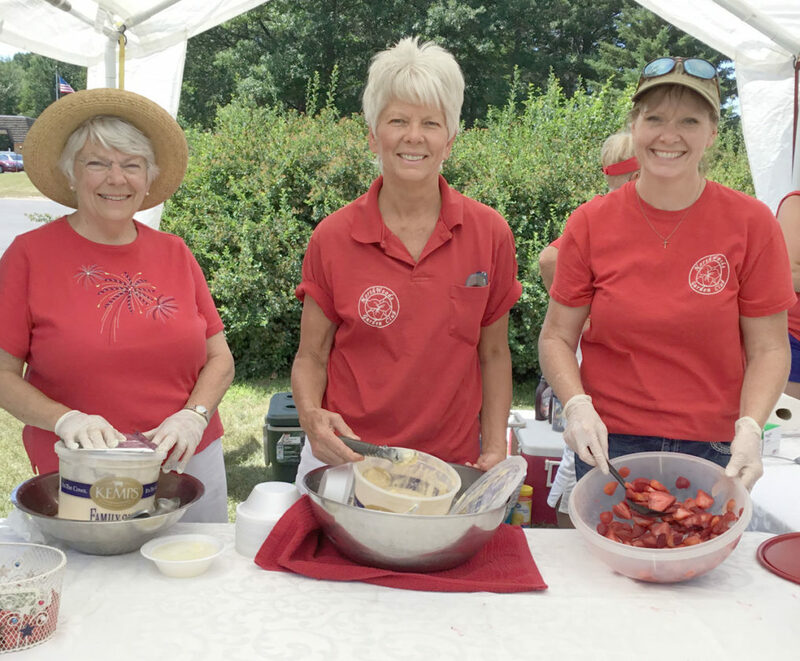 IRON MOUNTAIN — Abundant sunshine, fair skies, gentle breezes and harmonious melodies filled the air at the Northwoods Garden Club 29th annual strawberry social. The event was at the Gazebo Park, one of the sites maintained by the club, at the corner of Woodward Avenue and Balsam Street in Kingsford. A colorful array of blooming perennials and annuals, as well as striking floral arrangements, graced the grounds. Community members of all ages enjoyed strawberry sundaes and refreshments while patriotic, country/western, string drum arrangements, duets and nostalgic tunes serenaded the crowd satisfying their listening pleasure. The Golden Throats, a long-time crowd favorite, opened the festivities with a patriotic selection of songs including “America the Beautiful,” “This Land is Your Land,” and “God Bless America.” Their rendition of “Give My Regards to Broadway,” “Sentimental Journey” and “That Old Gang of Mine” created a nostalgic atmosphere. A return performance by the multi-talented Mitch Wiltzius included his solo adaptations of “At Last” by Etta James, “My Way” by Frank Sinatra, and “I Have Nothing” by Whitney Houston. Harmonious duets including the “Good Old Summertime,” “You Are My Sunshine,” and “My Country ‘Tis of Thee,” were performed by Patti Belongie and Wiltzius, accompanied by Sue LeDuc on the keyboard. Country and western fans once again were entertained by Eldin Paquin’s guitar/vocal performance, with selections such as Johnny Cash’s “Folsum Prison” and other country favorites. A local string and drum quartet comprised of Geri Hamlen, Mike Madigan, Pete Lehman and Tyler Wilson filled the park with blended country-style, toe-tapping music. The funds raised at this annual event are used to purchase plants and supplies necessary to maintain the club’s gardens at the Dickinson County Courthouse, Kingsford City Hall, the Veterans Memorial on Pine Mountain, Carpenter Green Space, Chapin Berm, Kimberly Corner and Gazebo Park. Northwoods Garden Club extends a special heartfelt thank you to all the local entertainers for giving so freely of their time and talent to make the event a success. Likewise, the Northwoods Garden Club is always grateful for the ongoing support of organizations, businesses, civic entities and private donors for their continued generous support. If you are interested in donating to the clubs beautification projects, look for our donation coupon in this issue of the paper. Donations can be mailed to NWGC, P.O. Box 104, Iron Mountain, MI 49801. Check the club’s Facebook page at Northwoods Garden Club or call Wanda, club president, at 906-282-1359 for additional information.